We have raised livestock for over 2 decades and we still learn something new and amazing about sheep and goats every year. During the last few years a significant part of our learning has involved volunteer assignments in Ethiopia, Mali, Egypt and Guinea as participants in the Winrock International Farmer-to-Farmer program, funded by the United States Agency for International Development (USAID). What expertise does a mid-west sheep and goat producer have that is applicable to Africa? We have repeatedly asked ourselves that very question. We have struggled, just like other producers, with lambing deaths, balancing rations, pasture watering systems, cost controls, labor availability, implementing and maintaining appropriate conservation programs. Are our experiences transferable to such a faraway place as Africa? As nomadic life vanishes on a global scale due to drought, political unrest, roads, corporate farms and large spans of irrigated crops disrupting century old grazing routes the art of traditional sheep and goat husbandry is becoming lost. To make up for scarcity of meat protein, small farmsteads with expertise in crops, are diversifying with livestock. But as land becomes more limited and livestock numbers are increased the result is intense overgrazing of small holdings, crop residues and shared community lands. The sheep and goats are no longer able to pick and choose from an extended area of forbs, grasses and browse. As their diet becomes more limited, their living areas overcrowded and often unsanitary, unfamiliar health and nutritional issues spontaneously occur. Still, there are many advantages of developing a small ruminant industry in regions with low resources—as long as there is adequate water, forage and basic (low cost) husbandry is implemented. Small ruminates reproduce and mature in less than a year (twice as fast as cattle and on far less resources). They are capable of surviving in terrain that is too rough for cattle while eating and thriving on forage that humans cannot digest. Sheep and goats are often referred to as “bank accounts on the hoof” as they are the perfect size to sell to pay for school fees, unexpected medical expenses or to eat at a wedding feast. They have genetically adapted to rough terrain that is not feasible for crop or vegetable production. They are easily handled by women and youth as their weight range is similar to human infants and adults. Small ruminants represent a wealth that is not controlled by the political elites such as with the petroleum, diamond, gold, and banking industry. Judy and Larry have participated in the Farmer-to-Farmer program funded by the United States Agency for International Development in Ethiopia, Mali, Egypt and Guinea since 2006 for a total of 9 projects. 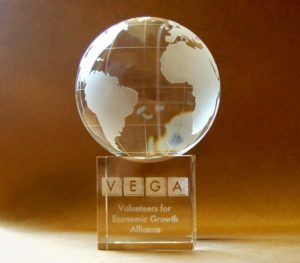 Judy received the Volunteer Impact Service Award (2011, 2012 and 2013) from the Volunteers for Economic Growth Alliance (VEGA) for her work in Mali. The video below is describes a USAID Small Project grant that they submitted and manage with the Browse and Grass Growers Cooperative. Winrock International Farmer-to-Farmer Program: Winrock’s Farmer-to-Farmer Program is one of a number of non-governmental organizations (NGO) that implementer volunteer assignments. Winrock fields approximately 200 volunteers each year to assist farmers, agribusinesses, and local organizations worldwide. Under this and similar programs, skilled U.S. volunteers provide expertise in a wide variety of areas, including agricultural sciences, farming, and agribusiness: enterprise development, marketing, international trade, food processing, credit and financing, training, organizational development and renewable energy. For more information on our volunteering activities go to our Common Pastures website.